Favored people: She is the matron of magicians, sorcerers, witches, and moon-gazers. 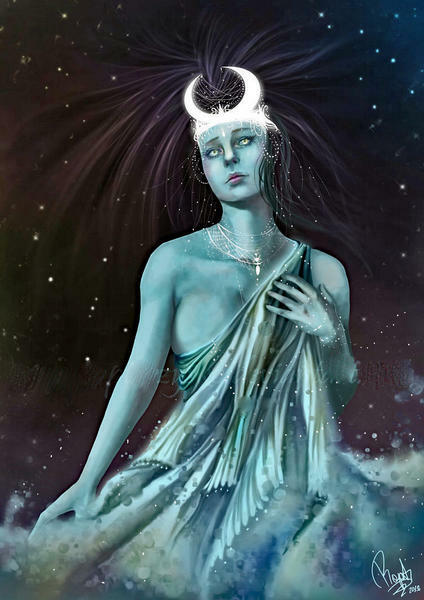 Selene is an ancient goddess of the moon. 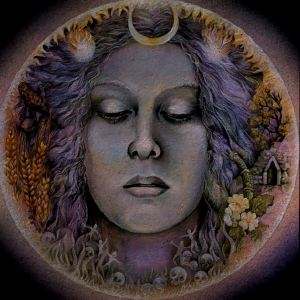 Comparatively little information regarding Selene’s veneration and rituals survives although she is described as “great in magic” and was apparently invoked in magic spells. Her parents are Titans, Hyperion and Theia. Helios, the sun, is her brother. Many of her functions were later transferred to Artemis as Helios’ were to Apollo. Selene bathes in the ocean before riding up to the sky in her chariot every night, variously driven by a pair of white horses, bulls, or mules. She pulls the full moon across the sky. Alternatively she rides a horse sidesaddle. Sometimes Selene has to hide from a dragon, indicated by a lunar eclipse or absent moon. Or perhaps Selene is just making time with that dragon. 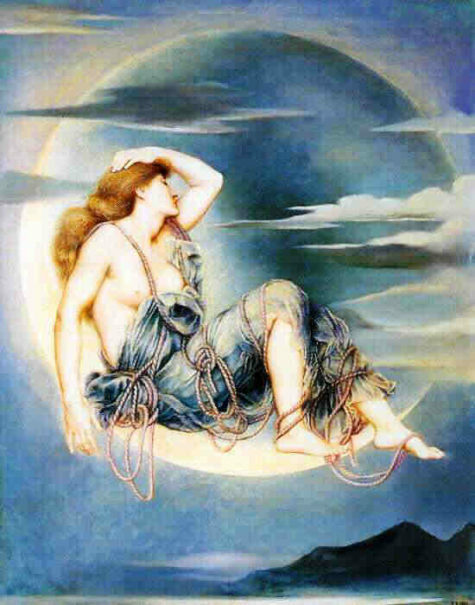 Selene is an amorous goddess with many lovers including Pan and Zeus, with whom she had numerous children. Her most famous love affair is with the young shepherd Endymion, the male sleeping beauty. Selene placed him under an eternal sleep spell so that his entire existence consisted of sleeping and making love to her. 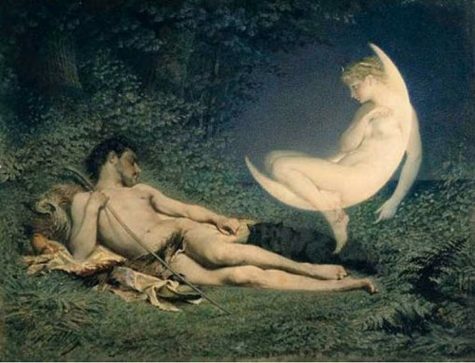 Selene spends her days in the Anatolian cave in which Endymion sleeps. Selene’s name is etymologically related to a word meaning “light.” In her guise as the full moon, Selene sheds light on problems and mysteries. Selene is the goddess of the moon, but she also is the moon. 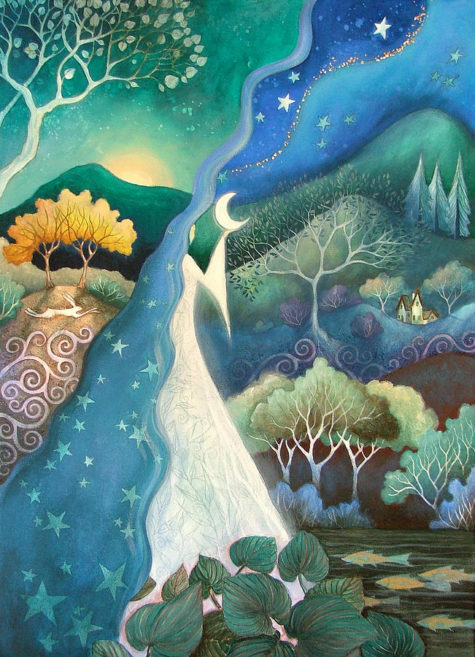 Selene may manifest as a woman or a cow, but you can also gaze at the moon and see her. As a woman, she is described as being very beautiful. 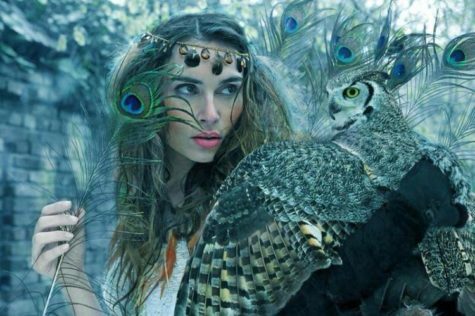 She has wings and wears a diadem. 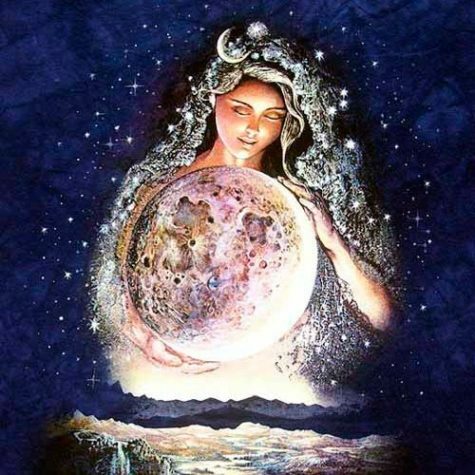 Also called Mene, or Latin Luna, Selene was the goddess of the moon, or the moon personified into a divine being. She is called a daughter of Hyperion and Theia, and accordingly a sister of Helios and Eos; but others speak of her as a daughter of Hyperion by Euryphaessa, or of Pallas, or of Zeus and Latona, or lastly of Helios. She is also called Phoebe, as the sister of Phoebus, the god of the sun. By Endymion, whom she loved, and whom she sent to sleep in order to kiss him, she became the mother of fifty daughters; by Zeus she became the mother of Pandeia, Ersa, and Nemea . Pan also is said to have had connection with her in the shape of a white ram. Selene is described as a very beautiful goddess, with long wings and a golden diadem, and Aeschylus calls her the eye of night. She rode, like her brother Helios, across the heavens in a chariot drawn by two white horses, cows, or mules. She was represented on the pedestal of the throne of Zeus at Olympia, riding on a horse or a mule; and at Elis there was a statue of her with two horns. 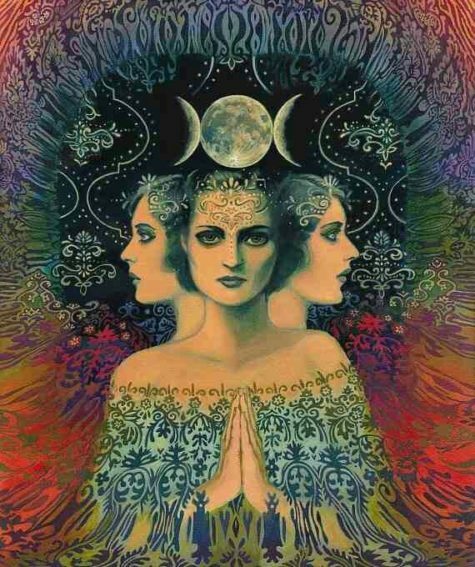 In later times Selene was identified with Artemis, and the worship of the two became amalgamated. In works of art, however, the two divinities are usually distinguished; the face of Selene being more full and round, her figure less tall, and always clothed in a long robe; her veil forms an arch above her head, and above it there is the crescent. At Rome Luna had a temple on the Aventine. Altar: Lay with a white cloth, on which is sewn moons of silver in cycle from new to dark. 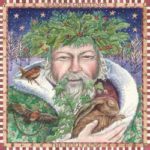 Set out two white candles rubbed with jasmine oil, a silver tray with round white cakes, a glass pitcher of goat’s milk, a glass chalice of white wine, a glass of clear anise liqueur, a round mirror, and a silver bell. Offerings: White foods. Milk, poured in libation. A promise to aid those suffering from mental illness or emotional confusion. Daily Meal: Nothing but milk or rice milk to drink. Rice. Custard. Cream soups and sauces. The cakes are passed around, saying, “Eat of the Mother’s sweetness.” Then the pitcher of milk is passed around, saying, “Drink of the Mother’s love.” Then the chalice of wine is passed around, saying, “Drink of the Mother’s dreams.” Then the glass of liqueur is passed around, saying, “Drink of the Mother’s song.” Then the remainder are poured out as libations and the silver bell is rung six times.